-Update from foster home. 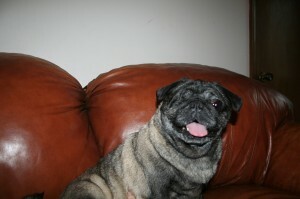 Sadie is house trained, very sweet, people oriented like most pugs are they want to be in the same room you are in. She will need to be with larger dog or alone. She is currently picking on smaller dogs. She does good with larger dogs!! She does have one eye and sees well out of it but can run into things sometimes. Sadie loves to give lots of kisses! So be prepared for some major lovin time!